Karpaga Vinayaga Educational Trust was founded to promote Educational and Health care needs of the Community, particularly for those sections of the people who are marginalized in Education, Economy and Social Status. The Trust already offers enough service in the above sectors of education and Health. It already owns “J.J. Institute of Nursing” offering “Diploma in General Nursing and Midwifery” at its campus J.J. Nagar, Sivapuram Post, Pudukkottai - 622 422. To further give more thurst on the out put of Health care personnel, the Trust decided to commence a “College of Nursing” in its campus, since the Trust has enough infrastructure and experience in this field of Health care. With this back round “Karpaga Vinayaga College of Nursing” has been started with the approval of Government of Tamilnadu (GO. Ms. No : 123 dated 10.04.2007 and The Tamilnadu Nursing Council (No. 88/NC/2009, dated : 10.06.2009) and is affiliated to the Tamilnadu Dr. MGR Medical University, Chennai. 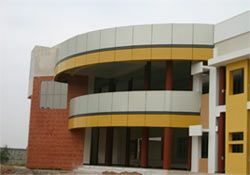 Initially the College offers only 50 seats for B.Sc. Nursing Degree Programme.